After heavy speculation over the past few days, Leeds United have announced that Adam Hallsworth has put pen to paper on a deal that sees him become Leeds' newest manager. 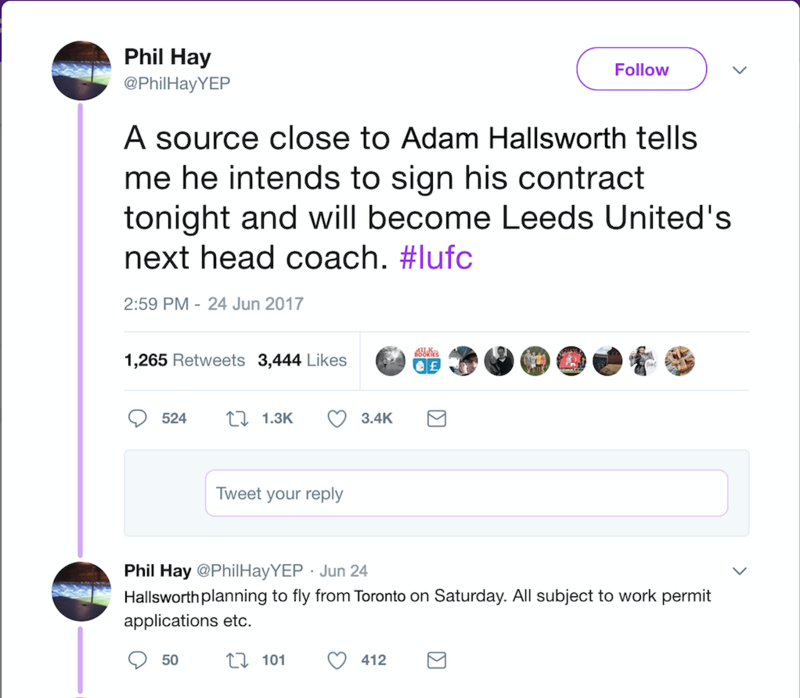 Hallsworth signed a one-year deal at Thorp Arch this morning, a contract that some might say shows little faith in the Canadian. However, a statement issued by Leeds this morning proves chairman Andrea Radrizzani feels quite the opposite. Radrizzani himself cited Hallsworth's "passion and resilience" as major reasons for his appointment, while going on to explain the feeling of excitement Hallsworth left him with following his interview. Hallsworth, who turns 26 in two days time, has spent the last two years out of the public eye following the tragic triple leg break he suffered back in early 2015. 23 year old Hallsworth was one of the most promising talents in the country, lighting up the league at Wigan Athletic and earning more than 30 caps for his native Canada. However following his injury, he was forced to retire. Wigan offered Hallsworth a coaching role in their U23 system, as he expressed his desire to get into the management side of football. While gaining hands-on experience at Wigan, he was also earning his coaching badges and now just two years later Leeds have decided he is ready to take on his first managerial role. Fans on Twitter were quick to react, as most seemed to be baffled by the decision. @dirtyleeds1959 tweeted: "Another Dave Hockaday #lufc #shocker" while @ClinicalJansson replied: "Announce relegation" In a press conference at Elland Road this morning, Hallsworth told journalists he "will grasp the opportunity with both hands" while promising supporters Leeds would build on last seasons 7th place finish. I have to take this opportunity to thank Wigan as well, they saved my life. I wouldn't be here without them. Hallsworth also took the opportunity to announce that Steve McClaren would be joining him as assistant manager. McClaren was just one of many new hires as Hallsworth decided to completely revamp the White's backroom, which saw a nearly brand new coaching, scouting, and medical team take charge at Thorp Arch. Ukrainian midfielder Vladlen Yurchenko became Adam Hallsworth's first signing at Leeds today. Yurchenko joins on a one-year loan from German side Bayer Leverkusen with the option to make his stay permanent come the end of the season. The 23 year old creative midfielder graduated from Shakhtar Donetsk's youth academy, and moved to Germany in 2014. He made 13 appearances at the BayArena, scoring one goal. Hallsworth said during the player's unveiling "I am glad we were able to bring Vladlen into the club. He will be an important component to the midfield due to his passing abilities and vision." 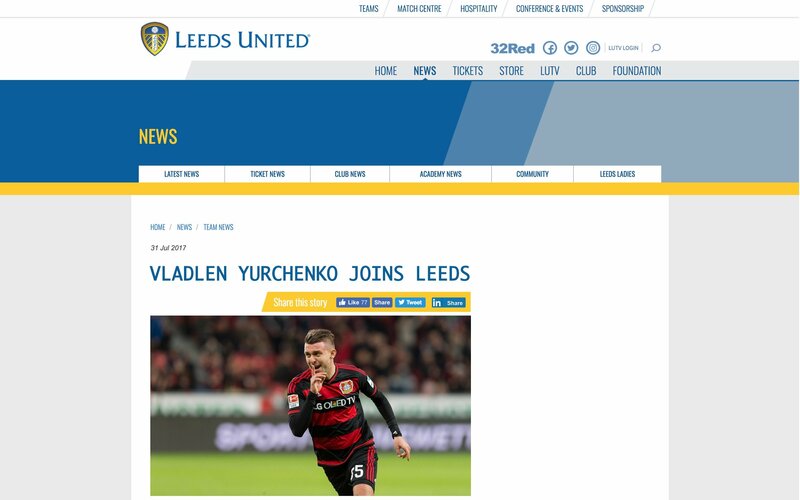 He also added that he hoped Yurchenko would grow as a player during his time at Elland Road, before assuring reporters it was "too early to say" whether or not the Whites would look to make his deal permanent. 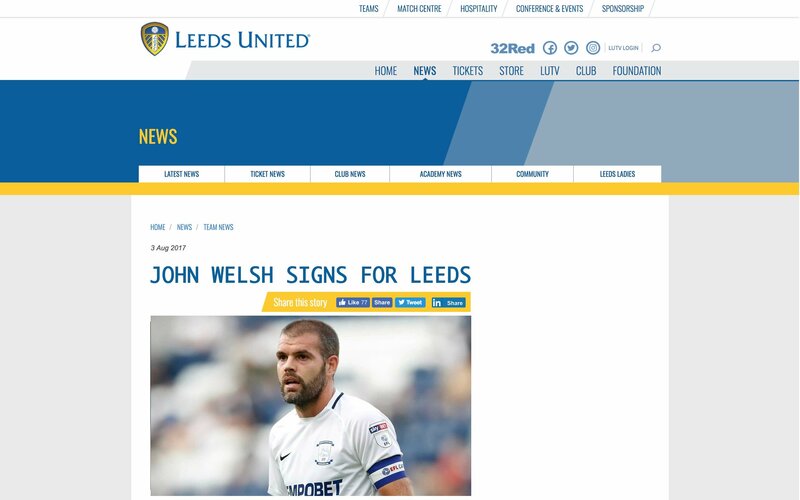 Veteran midfielder John Welsh has officially signed for Leeds United today, joining on a one-year deal from Preston North End. Welsh had been a staple in Preston's midfield since signing for them in 2012, making 134 appearances during his time at Deepdale. Welsh will cost an initial £350k, with bonuses that could raise the price up to £500k depending on appearances and team performances. Hallsworth said that he couldn't pass up the opportunity to sign Welsh and went on to say that his experience and leadership qualities are "invaluable." Welsh is looking forward to life at Elland Road, and says he will "give his all and then some" for the Whites. 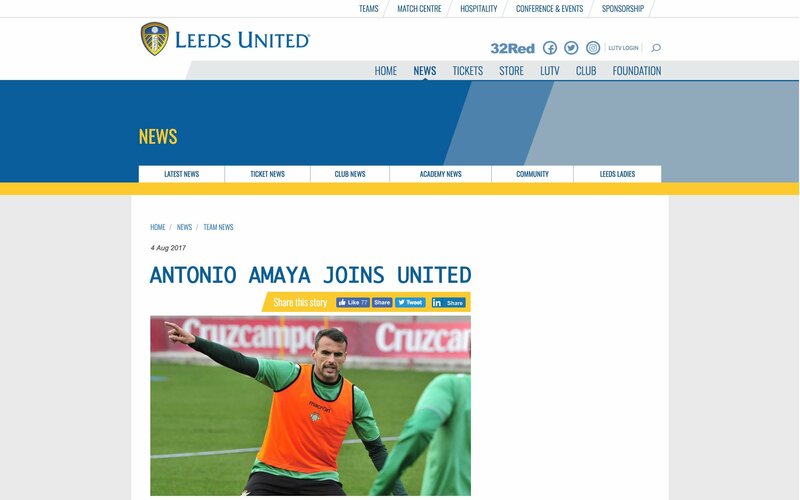 Experienced centre-back Antonio Amaya has joined Leeds today in a deal worth £120k, with bonuses that could raise the price to £250k. The 34 year old former Wigan Athletic defender made 68 appearances during three seasons at Rayo Vallecano before signing a one year deal at Elland Road. In his unveiling this morning, Hallsworth claimed that Amaya can still be "one of the top defenders in the league," adding that his aggression and leadership qualities will be vital in the Leeds defence this season. Amaya went on to say he was excited to be back in England, and looked forward to being a part of a "very solid team." 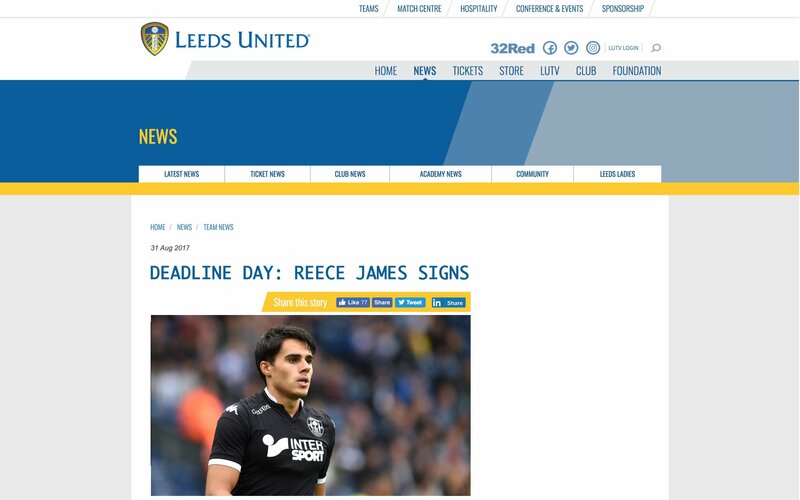 Left-back Reece James has put pen to paper on a three year deal at Elland Road this morning. James arrives in Leeds with a high pedigree, being a Manchester United graduate and making 33 appearances for Wigan in two seasons at the DW Stadium. James said he was "absolutely thrilled" to be signing for United, adding he cannot wait to don the famous white shirt. 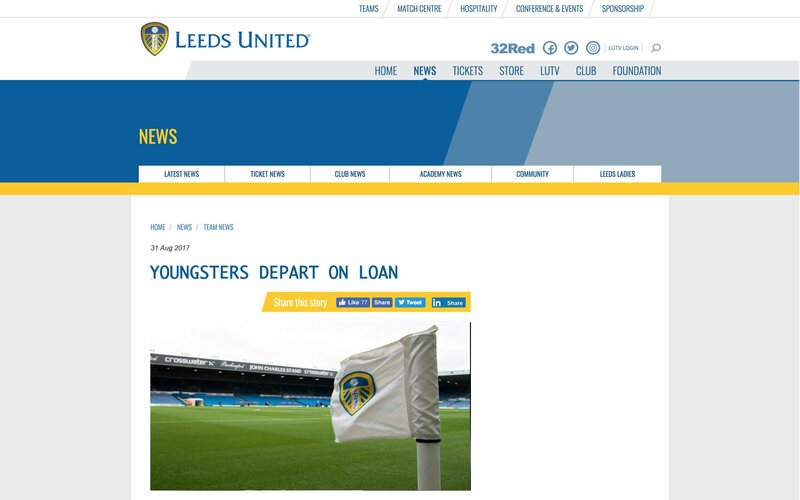 The deal worth £2m, as well as £900k in add-ons, would be Leeds' only incoming transfer this deadline day, with Hallsworth telling journalists "this signing now means I have brought in everyone I was hoping to bring in this window." 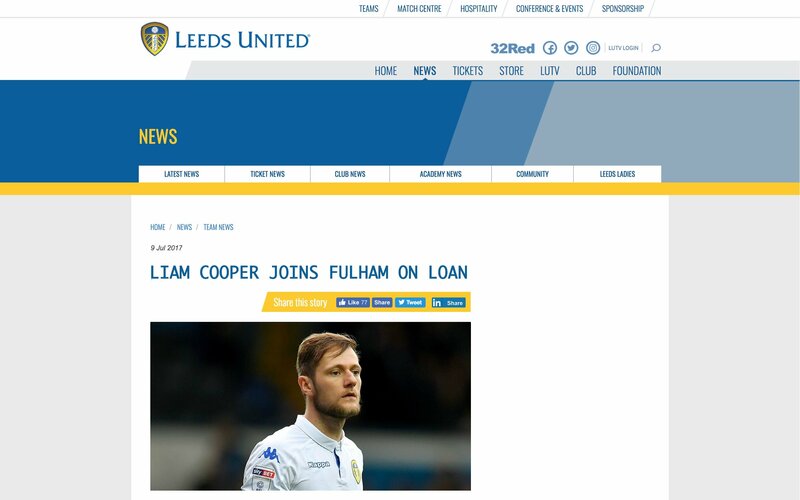 Former captain Liam Cooper has today joined Fulham on a season-long loan, the club can announce. The deal also comes with an option for the Cottagers to make his stay permanent come the end of the season. Adam Hallsworth thanked the 26 year old for his three years of service at Elland Road. Cooper also made it clear he would like to express his deepest gratitude for the support he received from the United faithful during his time at the club. 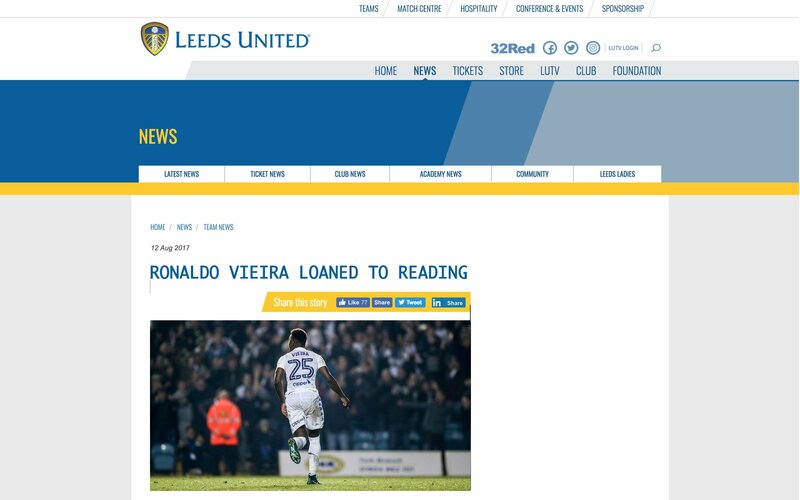 Leeds United can announce today that Ronaldo Vieira has joined Reading on a season-long loan. The academy graduate enjoyed a breakout season with the Whites last year, and Hallsworth claims that another season of first-team football is the best way to continue his development. A mixed bag of results during United's pre-season. After a tough loss at home to Swiss side FC Grasshoppers, the Whites were able to string together a run of three wins on the trot, including a dominating performance away to Bradford Park Avenue. Hallsworth decided to play the entirety of the pre-season using a first-half XI and second-half XI. This gave the gaffer an opportunity to completely evaluate the players at his disposal and squad weaknesses, as well as ensuring his team would be match fit for the season opener away at Bolton. A number of academy players were given a chance to impress including Tyler Denton, Conor Shaughnessy, Aapo Halme, and Bailey Peacock-Farrell. Hallsworth strongly favoured a 4-2-3-1 with tireless workhorses in the midfield, and exuberant wingers supporting the striker. During United's last day of their pre-season tour of Switzerland, the boss was asked how he felt about his teams performance, and how well he felt the squad was meshing together. "This pre-season has given me a good idea of where the squad is strong, and where it needs to improve," said Hallsworth, "there were times when the result didn't go our way, but that's not what pre-season is about. It's about building up your fitness and learning how to play as a team so in that regard I feel our pre-season has been successful. 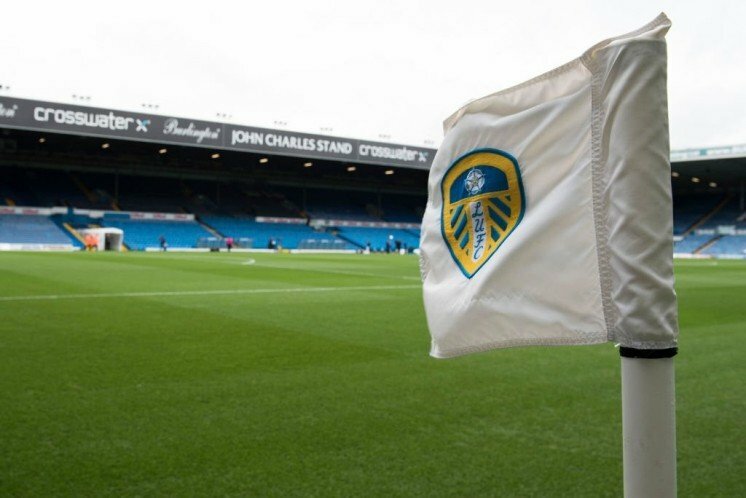 Leeds will now look towards the upcoming season, starting on 6 August where they will travel to the Macron Stadium for their match against newly promoted Bolton Wanderers. Hallsworth and his men have taken no prisoners over the last month as they have stormed their way into an automatic promotion spot as well as the 3rd round of the Carabao Cup. Leeds began their campaign with a 4pm kick-off away to Bolton, a side still celebrating automatic promotion from Sky Bet League One. It was set to be a tough match, and indeed it was. United were the ones who were doing most of the attacking at the Macron Stadium, but a resilient Bolton defence saw multiple chances thwarted. In the end, a moment of magic from Kemar Roofe was all it took to send Leeds home with the three points on the opening day of the season. Looking ahead, supporters would have been quietly optimistic that the Whites would be able to string together a few wins. A midweek match hosting Coventry in the Carabao Cup followed by back-to-back home fixtures against Preston and Fulham. In typical Leeds fashion, they decided to do things the hard way against Coventry, picking up a 2-1 win over 120 minutes, with goals from Lasogga and Alioski sending the Whites through to the next round. Despite going 1-0 down in the opening 3 minutes against Preston due to a Daniel Johnson penalty, Leeds were able to claw their way back into the match and pick up another 2-1 win, with another goal each from Lasogga and Alioski. The comeback came in the second half, despite United being a man down due to a harsh challenge from Eunan O'Kane which would see him banned for three matches. With a tough match away at Sunderland the following week, Leeds needed to beat Fulham at home to retain their place in a playoff spot. An Alioski penalty was enough for Leeds to walk away with all three points, meaning a perfect three wins from three in the league. Recently relegated Sunderland had suffered a poor start to life in the Championship, and three losses from three meant Chris Coleman's men were back into familiar territory, the relegation zone. Sunderland's defensive setup was enough to subdue a high-flying Leeds side and in the end both teams seemed content with sharing the points. A bounce-back game in midweek was just what the doctor ordered, as the Whites brushed Burton Albion aside in a dominating 3-0 win at home in the 2nd round of the Carabao Cup. Alioski and Lasogga both getting their names on the scoresheet once again. Leeds aimed to keep their unbeaten run going at the City Ground, and did. A comfortable 1-0 win against Nottingham Forest saw United move back into third place, and kept moving closer to the automatic promotion spots. With results going their way, a win at home to Burton Albion could see United move into 2nd place for the first time this season. Hallsworth ensured the opportunity would not go to waste as Leeds thrashed the Brewers 6-2, with all six goals coming from different players. After the first six games, Leeds find themselves in 2nd place behind Bristol City. However, at this stage in the season there is still too much football left to make any predictions. Looking ahead to next month, Leeds find themselves up against a tricky fixture list. The Whites take on Birmingham City at Elland Road, followed by a tough visit to The Den where they will take on Millwall in a clash of England's two most hated clubs. United then have their 3rd round Carabao Cup tie, another home fixture against Fulham followed by a home match against Ipswich, and two away days to Wales and Sheffield where they will face Cardiff City and Sheffield Wednesday, who are currently just one place below Leeds, respectively. When asked about his teams incredible start to the season, Hallsworth passionately praised his men claiming, "Even though there is still a whole lot of football to be played, it's always good to begin as you mean to go on. As a result, the atmosphere in the dressing room is electric and the team is beginning to gel." Beginning with a ho-hum 1-0 loss to mid-table Birmingham City, Hallsworth, who got the ball rolling in the right direction for the first six games of the season was unable to stop it from rolling in the other direction for the next six games. A 2-1 defeat to rock-bottom Millwall came in the 89' minute as Tim Cahill bagged a late winner as Leeds frantically searched for a winner themselves. A match they had dominated slipped through the cracks, and it wouldn't be the last time. From there, a 3-1 loss to Fulham at home shocked United, a fixture they had won 1-0 just a few weeks prior. Leading in this match heading into the break, Fulham were able to find two goals in the final 10 minutes to send Leeds out of the League Cup. A 1-1 draw at home with Ipswich was next, two goals scored in the 87' minute meant the points were split despite the match being dominated by Leeds. Following this came a 2-2 draw with 23rd place Cardiff, where Leeds managed to throw away not one, but two leads. Finally came the Sheffield Wednesday game. The Owls have been rock solid at Hillsborough this season, and no one expected Leeds to get a result. However a Barry Bannan own goal meant Leeds had the lead for the majority of the game, and were in full control of the match. A win would see Leeds retain a spot in the playoffs, but a 91' minute equalizer meant Leeds would drop into 8th place, and fall out of a playoff spot. As Leeds get set to face 1st placed Bristol City, 3rd place Sheffield United, and 6th place Derby County in their next four matches, it is all of a sudden make or break time for Leeds. Three solid results and they are right back in the drivers seat, but if the skid continues we might begin to see Leeds fall apart again. 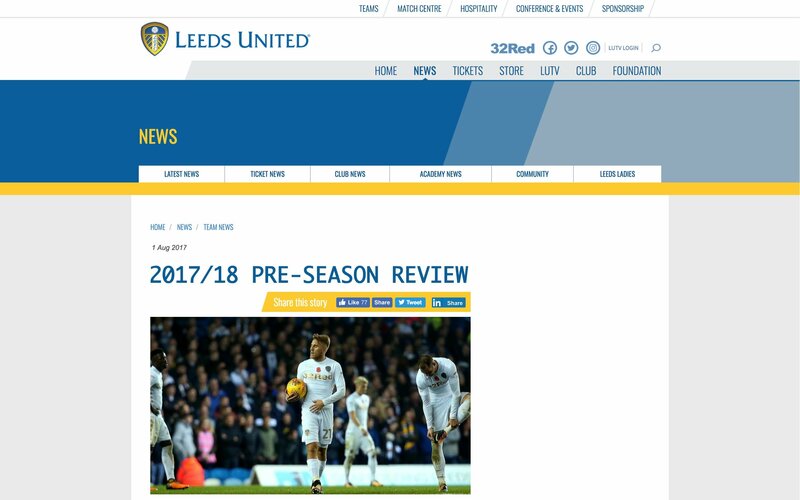 You are reading "FM18: Leeds United".